A couple weeks ago, I was asked by the talented ladies of Sakura of America, Hello Lucky! cards and Egg Press to participate in their fun and smashingly successful #write_on campaign, and so far it's been a blast for me, and amazing to see the online community's response. So many people across the country are heading to their local post offices or post boxes, or personal mailboxes, putting their flags up, and sending real life, tangible, gorgeous mail to the people in their lives. The photos on Instagram, the events that these pioneers have been putting on, and the discussions on every stream of social media have been a joy to follow. 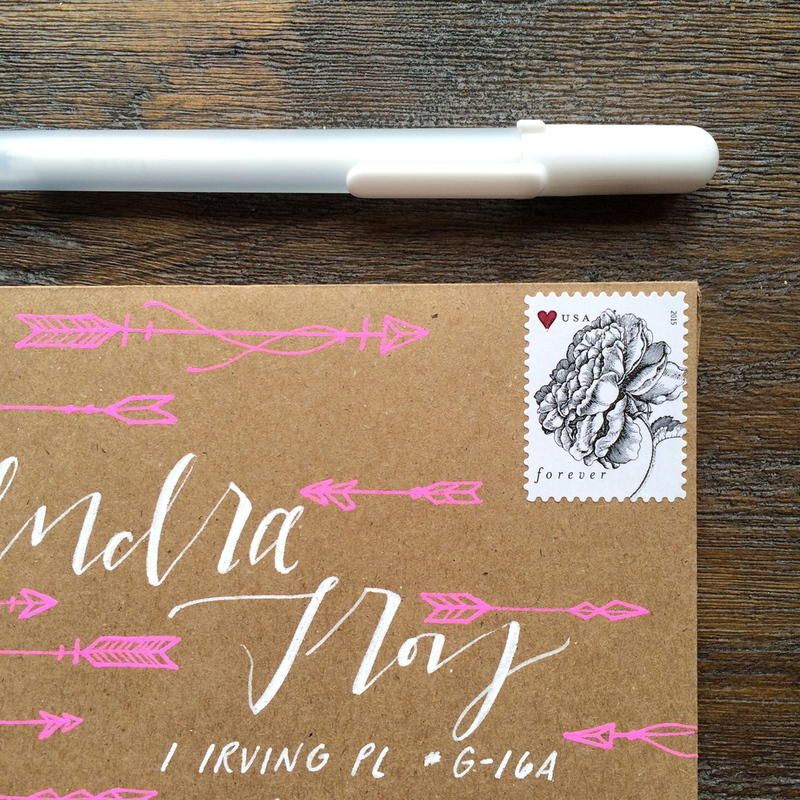 I was also approached to write a blog post for the #write_on campaign detailing some tips and techniques for simple and effective ways to dress up your envelopes. This being prime wedding season as well, envelope and addressing discussions are definitely top of mind for me. But further than that, if you approach the front of an envelope as a little mini canvas, carrying some crucial information, it can be a really lovely way to stretch your creativity. Here are a few photos and snapshot moments from the post - and you can read it in its entirety over here. FYI! For any brides-and-grooms-to-be, I'm currently taking on clients for the 2015 wedding season - whether you don't want the burden of writing down every single address and trying to keep it all in a straight line, or you want a unique and hand lettered and illustrative approach to your whole invitation suite, I'm here to make your gorgeous ideas come to life. Click on over to the Contact page to send me an inquiry, and I'll always get back to you within 24 hours. I'm also available for hire on editorial and freelance lettering/illustration projects. Think up and dream up something amazing, and let's work together! Here's to love and sending love through the mail! my very dear wonderful talented friend, rebecca elliot, came to visit san francisco this weekend, so it seems only apt that my next sf crushing series is focused on letterpress studios in the bay area. rebecca herself is a letterpress maven, with a giant hunk of steel of her own back in chicago, and meekling press as her homestead for printing unique and quirky (not to mention exceptionally well-written) books and story collections. in her honor, here are my picks for this corner of the country's best handlers of old vandercooks and chandler and prices. olivia san mateo, owner of this berkeley based print shop, has such a lovely, natural eye for collection. each piece in one of her wedding suites can stand well on its own, but put together with all the elements, the whole unit speaks clear and well-constructed volumes about the couple getting married. i especially love her use of texture, natural elements, and of course, varied types of type. i really appreciate a designer who can weave a story into their work - and her use of layers, small details, and perfect color palettes does this for everything she prints. another berkeley enterprise! twig & fig have, first of all, such a quirky and fun website - this tips me off firstly that their work is made up of personalized and unique elements. i love their uncomplicated, slightly edgy, sophisticated, and utterly fresh approach to designing. it's clear that their inspiration comes primarily from the people they work with. 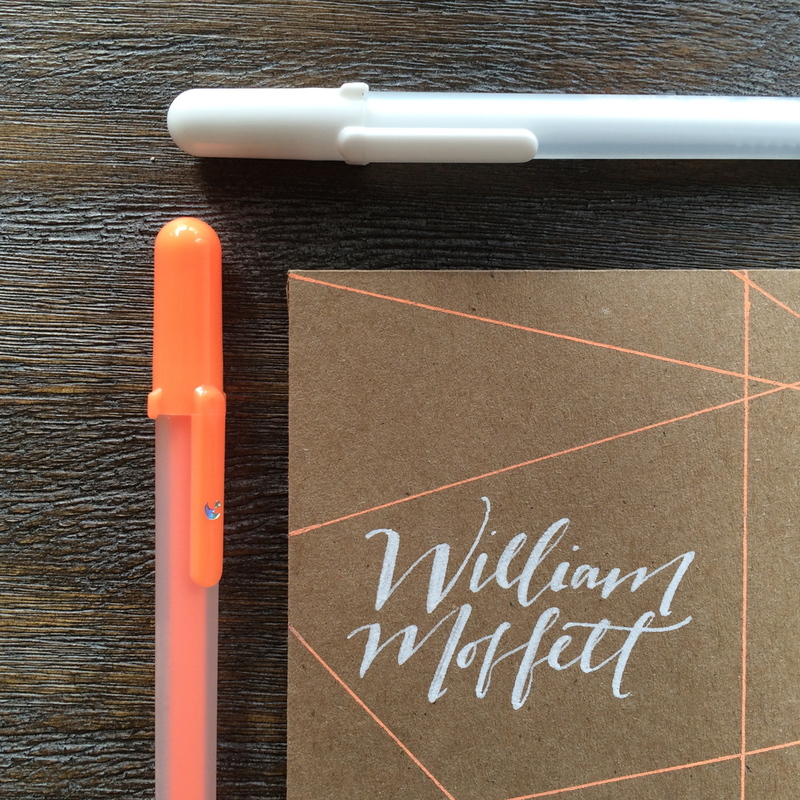 which, when paired with masterful letterpress and design skills, ends up yielding incredibly gorgeous stationery and invitations. well, apparently i'm in love with letterpress studios based in the east bay. it might be a little biased, since i'm in oakland now, but seriously, when you go take a walk around aerialist press's website, you just tell me how hard it was for you to leave. not only do they have an abundant portfolio of gorgeous, delicate, type-and-illustration-driven designs, but when executed onto paper, the final product takes your breath away, it's made so well. i also have a particular penchant for design teams that are motivated not only by their clients' love, but by their own. alexandra and craig have such a lovely story, and it's evident that they infuse every project they undertake with the same passion and dedication that they share with each other. so much love for these paper wielders. tune in next week for a peek at some of my favorite winery wedding venues in the area! new online hand lettering workshop! for all of you who have been yearning to learn how to hone your own hand lettering skills, i have a treat for you! i'm running an online 6-week hand lettering workshop, live via skype. this workshop series is intended to be a private lesson experience, with half hour sessions every wednesday at a particular time slot, giving you ample time throughout the week to practice the skills we went over. there will be fun practice homework, and i'll be at your disposal the entire length of the program to answer questions, provide feedback, and share helpful guidance. you must have access to skype, and a materials list/course syllabus will be provided upon registration. sign up at www.jillyink.com/workshops. looking forward to seeing you on the web! my wonderful friend, molly, is about to welcome a new little boy into the world any day now. a few weeks ago, her talented coworker tiffany munster, of soiree weddings and events, threw her the most well-styled, deliciously catered, fun and hipster-inspired baby shower at the beautiful headquarters of stem line creative. in attendance were some of the coolest people in the chicago wedding industry - including naomi from tipsy cake, who brought over a blue velvet sugar-dinosaur topped cake for the mum-to-be. i wish i had some photos from the actual night; here are the menu signs and place cards i put together for the shower. i can't wait to meet molly's little boy, and if he's anything like his mum, he'll have excellent taste - in friends and design. valentines day is around the corner, and to lead up, i'm doing a series of love poetry calligraphy. starting with rumi's 'i swear'. can't distinguish the birdseed from the snare. A little beauty for your January morning. I hope you enjoy! over the holidays i had the great fortune to work with some amazing new clients, chicago-based wedding and event planners, and some very creative individuals. one of my favorite (favorite!) shoots took place at the historic keith house in chicago's prairie district. it's located in a pocket of chicago that's home to some old mansions, a quaint little park, one of my best friends, and a path that takes you straight to the lakefront. tiffany siladke (a splendid occasion), a talented chicago-based wedding planner and event stylist, had such a gorgeous vision for this inspiration shoot. she wanted to air on the darker side of things - it being winter and all - and decided to incorporate some animal-inspired elements. complete with antlers, cages, fur, darker, lush florals from natural beauties florals, antique pieces from rent vintage chicago and aged vintage rentals, amazing pies from bang bang pie shop, the whole shoot had an amazing woodland wonderland/big bad wolf feel to it. not to mention the models were stunning, with hair and makeup from nika vaughan. i was asked to create some hand-lettered menus for the table design, a sign for the place card table, and individual place cards that fit into gold-painted animal figurines. tiffany hand-charred the edges of the paper, which gave everything even more of a forest-feel. in truth, i loved putting together the paper elements for this shoot. and i love the photos even more. i can't quite share the professional (and might i say breathtaking) photos that karissa kreager took, but here are a few self-shots of the menus and place cards for you. i promise to share the full photo set once it's been published! well, hello there! happy 2014! i hope all of your holidays were filled with joy and abundance and love and laughter and good wine and plenty of pie. and now that all that's over with, and our attention inevitably draws towards cleansing.. well, everything - our health, our careers, our relationships, our closets - i thought i'd share what my new year focus is for 2014.
instead of resolutions, instead of goals, instead of deadlines (though not the ones set by my clients - of course, i'll still adhere to those).. i'm setting systems. consistency is the name of the game for this year; developing clearly outlined, manageable, workable systems for my career and my health that i can plug into and remain committed to, no matter the outcome. i read this great article over the holidays that put a lot into perspective for me - goals have a way of making you feel like a failure if you don't succeed. systems have a way of perpetuating success, validating positivity, and ultimately sustaining motivation. even after you achieve a particular goal, it can become very easy to fall off the building you worked so hard to create.. or to stand atop it and not know what to do next. with creating a system, if your consistent action is to build a little bit every day, eventually you'll have created an entire city of structures. so - for jilly ink, creating a system for reaching new clients, developing new relationships, venturing out into new industries, honing new and old skills, and making work - regardless of pay - every day is my focus. i can only believe that investing time in my business is the best thing i can do. what are your focuses for the new year? a few weeks ago, a lovely young woman named megan approached me about being the subject of her photojournalism class final project at northwestern university. she was to follow and document someone with a 'visually interesting' career, and after having worked as an intern at illumine magazine this past summer (remember this back cover and sanskrit work I contributed? ), she thought my work warranted such documentation. it was quite an adventure, especially over the last few weeks, which were filled with incredible inspiration shoots, custom calligraphy prints, and artwork for two different venues. she spent some time photographing my workspace, how i go about my day, and the other gigs i have going on - teaching yoga and consulting for arbonne. she's lovely, she's got her own website, writes for her own blog, and is the editor of the northwestern publication, spoon. stay tuned for more recent work to come! and and! 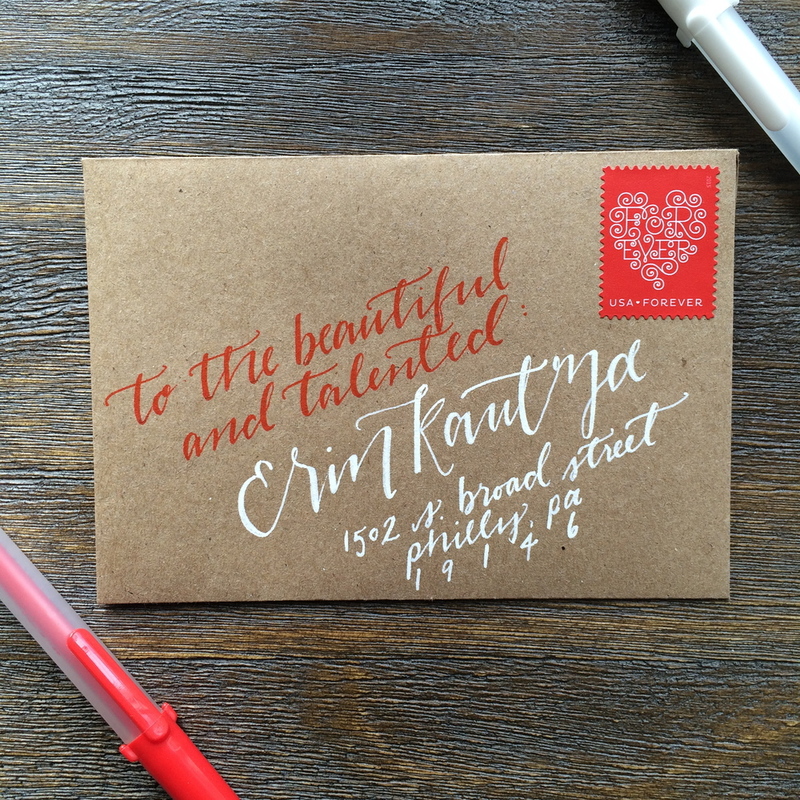 i'm currently taking new wedding clients for 2014, so if you, or someone you know is getting married in the next year, loves beautiful hand-lettered type, and working with someone who loves love, send on over a message. i'm thinking about holiday season much differently this year. yes, for the past few seasons, i've tried hard as i could to buy local, handmade, artist-created wares, goods, artwork. i've even tried making things for loved ones. this year, i'm going to focus on simple. very simple. well-chosen words, photographs, pictures, drawings, paper. ordinary things made more beautiful by a new, vibrant approach. maybe an intriguing postcard acutely placed in a gorgeous frame. or a set of vintage silverware with the handles dipped in paint. along these same lines, in the etsy shop, i'm currently offering simple, hand-lettered quotes on 8x10 paper. whatever quote, saying, words you can think of will be transposed in my calligraphy and sent to you, ready to be gifted, (or framed, and then gifted. or wrapped around something else, and then gifted. or kept for yourself). 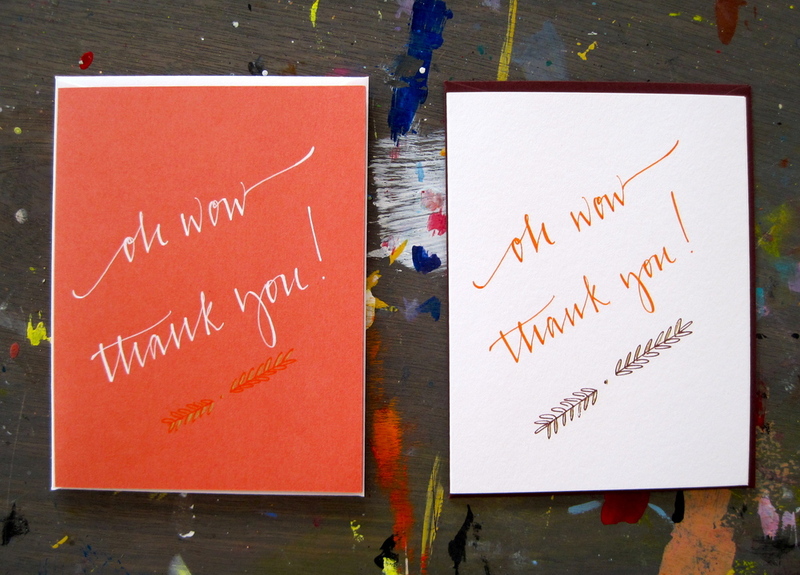 i figured this was a lovely, cost-effective way to gift my love of lettering to holiday celebrants everywhere. it's early, yes, but think how much more you'll be able to enjoy your egg nog and ugly sweater parties knowing your holiday shopping is all done (and looking pretty beautiful, if i say so)? cheers! 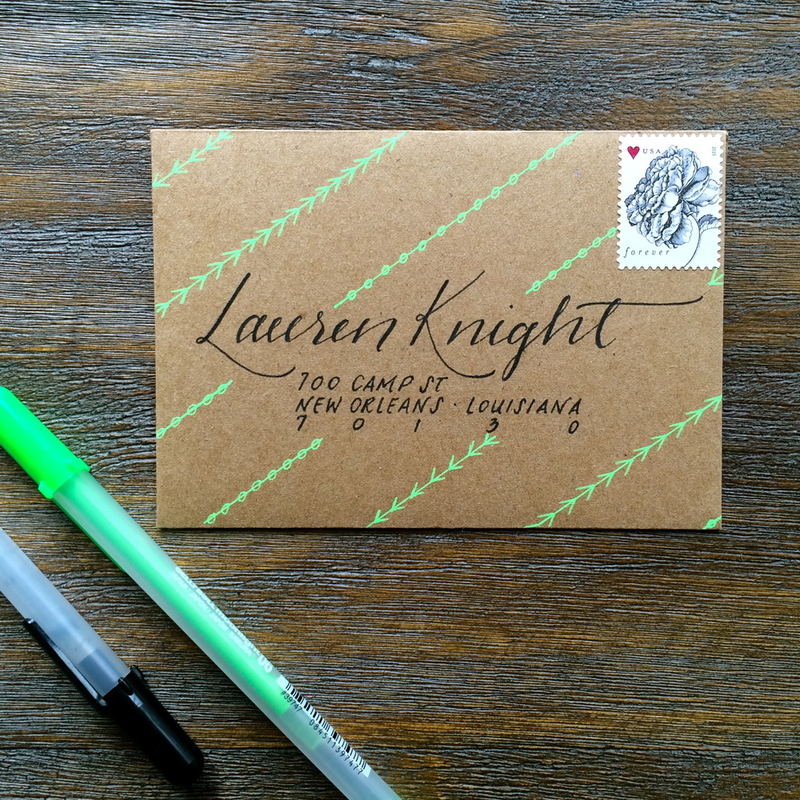 - find the listing for custom hand lettered quotes here! i met the most wonderful man at an art opening this friday last year. and since then, i've been experiencing this moment over and over and over again. from a very quirky movie about a very quirky lady, this quote says it all. drawing and designing tattoos for people near and far has been such a cool and strange and unexpected part of my career. i love love getting to know a little bit (or a lotta bit) about people that i otherwise wouldn't have met had it not been for the great reach of the internet. even more, however, i love being able to create something meaningful for someone i've had the great pleasure of spending some person-to-person time with. it might be faux pas to do work for friends and family, but in my case, having the ability to work with care on something as intimate as a tattoo design has only ever been a joy. it allows me another opening into this person's life - a perspective i might not have been afforded the opportunity to view. if i could, i'd draw all over my friends and family members' arms/legs/backs/necks/etc! this one is for a special and incredible bostonian - marisa, i can't wait to see how it turns out! it's my oh-so-favorite-favorite-favorite time of year, and chicago's delivering some amazingly gorgeous weather for the occasion. and while it's not quite so picturesque as a new england autumn, the moments of red and amber colored trees, crinkling leaves underfoot, pumpkin pastries and scarf-clad bike rides have filled me with such elation, that all the work i've been scoring has made this season all the sweeter. stay on the lookout for some exciting new editorial work involving an upcoming YA book series, a few new tattoo designs, magazine back cover lettering, and these brand new thank you cards, now available in the shop! although there are still challenges, and moments of unsettledness, and a future that sometimes seems impossibly far away, the optimistic side always wins out. and then the work gets better, and more abundant. thank you for following along! the best part about being a freelancer/small business owner of a creative studio is flexibility in the kind of work i can take on. you'd be surprised, and then actually not surprised at all, at how many venues there can be for hand-lettered text. With tattoo design and wedding envelopes under my belt, not to mention a few wall design branding gigs and some fine art commissions, it's been incredibly fun and exciting to dream up and wonder at where the next piece of work will come from. imagine how thrilled i was, then, to receive a call from lourdes paredes, the publisher of a brand spanking new chicago-based yoga magazine. she'd seen my work on the michigan ave lululemon chalkboards, and thought i'd be a good fit for some editorial artwork in the premier issue of illumine. of course of course! not only have i taken her class at exhale spa, but sitting down and chatting with her about the yoga community, bringing people together from all over the city, cross-promoting different businesses, i was instantly inspired and wanted to be a part of something that seemed to speak to a lot of my own personal beliefs. add to that her general inquisitive and authentic demeanor, and the connection was unmistakeable. for the premier issue, i was asked to design the inside back cover, as a sort of 'inspiration page'. readers can tear it out, put it on their walls, share it with other people, etc. after having painted a chalkboard wall in my shared studio space at both sides gallery, i knew it needed to be put to good use for this venue. i was also asked if i might take a stab at writing some sanskrit for one of the internal articles. i won't lie, i was a bit nervous about putting my hand to work on such an ancient and intricate language. it took a lot of practice, and a different approach to the written word as more symbol-focused, rather than letter, or meaning-focused, but after a short while, i got the hang of it. the lovely illumine intern, ashley, even came by the gallery to photograph the work and do a mini interview with me about jilly ink, and my apparent obsession with handwriting. here's to more, and different, and crazy, and cool, and interesting work ahead! i've been receiving a lot of lovely feedback on the newest september show up at both sides gallery in pilsen, chicago. and an overwhelming amount of questions on how to purchase the work, if it's for sale, where can it be shipped to, etc etc etc. so! with great aplomb and excitement, i'm proud to announce that all the framed typographical illustrations currently on view at the gallery are also available for purchase through the jilly ink etsy shop. browse away, but remember- these are one-of-a-kind pieces of work, so be quick to the draw if you want one for yourself! have a lovely and gorgeous and wonderful september autumn day! it may not involve 900 pages of glossy advertisements, and annie leibovitz-esque couture photographs of kiera knightly or cate blanchett, but the september issue (read: show) of artwork at both sides gallery in pilsen, chicago is, in my opinion, pretty spectacular. working in the same space as artist meg frazier has been nothing short of a dream. there are days when we both get nothing done, and spend the day talking about the situation of the artist, how to monitor our finances, what we'd like to be when we grow up, how we pretty much are what we'd like to be when we grow up... and then there are days when the music's playing (or not, if we forgot to turn it on, and we're in the zone) and she's painting and i'm drawing and we're laying down finished pieces like they're cookies coming out of the oven. and so, after all that baking.. err, making.. here's what we recently framed and put up on the walls of both sides gallery, just in time for the september edition of the chicago arts district's second fridays art walk. these lovely pieces are on display at both sides gallery - 1840 s halsted st. chicago, il 60608 - and will also be available for purchase in my shop next week, so send me an inquiry at jilly.ink@gmail.com if you want a stab at them first! the month has come! september! both sides gallery! my work, supplies, kitchen dishes and pens and favorite coffee mug - we're all moved in and ready and raring to get started on the next 6-9 months of intensive art making, calligraphy business-building, networking, life-owning, inspiration-seeking, and general craziness that's surely to come. i can't wait to share it all with you as it unfolds. in the meantime, take a look at some of the words i've been writing and places i've been visiting over the last two weeks! Phew! August is already more than halfway over, and it seems crazy to me that so much has happened in the first 19 days of this summery month. Renovating and revamping a gallery space in Pilsen, frantically making work for the Chicago Arts District 2nd Fridays Art Walk, hanging the show, frantically making more work for the Pilsen Unisono Festival, designing a mini jilly ink booth, teaching painting classes, planning for the next three months at the gallery, putting together some exciting editorial work for magazines, commercial work for clients, and plugging away at the upcoming designs from the jilly ink wedding stationery line - this has been one crazy month, to say the least. The thing is, though, I'm realizing I wouldn't have it any other way. Ok, maybe with a little less pressure, but honestly, the deadlines, the excitement, the collaboration, planning, productive daydreaming, painting - living fully in everything I'm passionate about is so incredibly exhilarating. I'm so pleased to share with you the work that made it into the gallery for the month of August. And! Look for some pretty/strange/pretty strange skull prints to be popping up in the jilly ink Etsy shop this week as well! nine months ago, i was invited to show work at the gorgeous both sides gallery space in pilsen, chicago. it was a magical experience, full of meeting new people (one of which just so happens to be pouring me a cup of coffee right now), putting my art work out there, gathering feedback, and becoming exposed to one of the most vibrant art communities in this fair city. tonight, nine months (to the day, and date - how about that?) later, i'll be showing another series. you may remember when i drew a few bones back in the fall.. well, i've decided to expand on that idea and move a little deeper..ehem.. into the body, and context. the theme of this month's show is 'inner beauty', so my take on that was to use suggestive phrases typically geared towards certain parts of the female and male bodies, and juxtapose them alongside illustrations of bones about which they'd be construed as positive attributes. i'll have much more photos to post next week about the opening tonight (i might have a few pieces that need finishing this afternoon... ever the procrastinating artist), but here's a sneak preview of two of the pieces i'll be framing and hanging on the walls. if you happen to find yourself in chicago tonight, stop by both sides gallery from 6-10pm, on the corner of 19th and halsted. or stop by anytime this month to take a gander at the show! i love the idea of a wedding guest book; a timeless record of all the people you've loved and cherished enough to invite and spend $70 a plate on at your momentous wedding day. a space for everyone, the young, the old, those just walking in, and those a little less sober than when they walked in, to write pages upon pages of just how happy they are for you on this next chapter of your life with your partner. theoretically, it's lovely. in reality, what actually happens to it? maybe you read it once - maybe once a year on your anniversary - maybe one third of the pages are filled, maybe no one managed to spill wine all over it at one point in the night. regardless, it's usually put away after the big day, with the photos of the wedding taking precedent as the day's record. but, what if there was a different way to keep track of your loved ones in attendance? and then, instead of putting it away, it's displayed, framed, hung for all to see and marvel at? well, a dear friend and former coworker of mine commissioned me to make such a piece for her this past week, and i'm delighted to share it with you. modeled after a snapshot she sent of another guest book she'd seen, this is a print with a cutout vw bug, and lots and lots of little 3d balloons for guests to write their names on. afterwards, whitney and scott can frame this and hang it up; a gorgeous reminder of the love they shared together, and with their family and friends! congratulations whitney and scott!